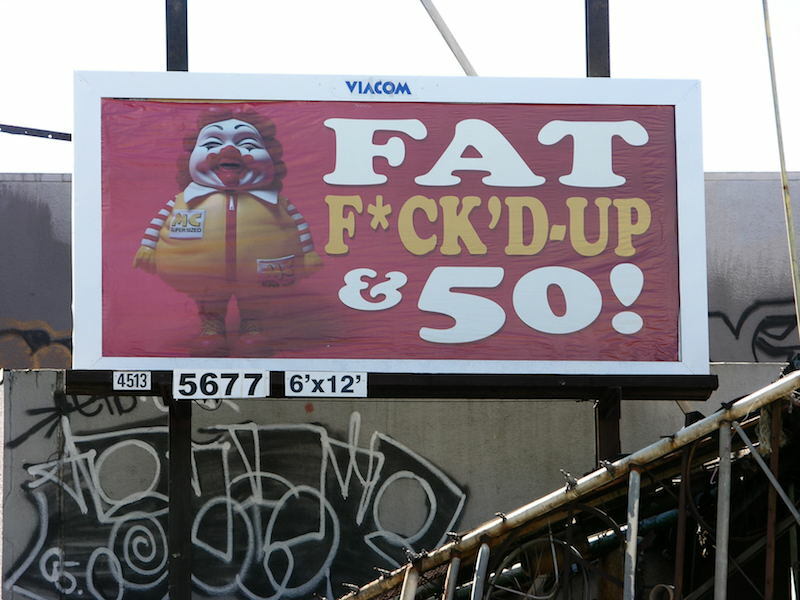 A 2005 ad takeover by Ron English in San Francisco. Photo by Lisa Müllerauh. Ron English, Evereman, John Fekner, Keith Haring, Shepard Fairey, Brian Donnelly aka Kaws, Barry McGee… These artists and many others put their work up in place of or alongside outdoor advertisements like billboards and ads in bus shelters before distribution and documentation of such work online was commonplace. So I’m not trying to say that it was impossible to take over billboards before Art Crimes launched, but an individual ad takeover means a lot more today than it did 20 years ago, as each takeover that is shared online can spawn imitators worldwide. The effects of any individual takeover can be felt long after it has been taken down and replaced by yet another poster for yet another pop album or crappy tv show. Ad takeovers are a form of street art and graffiti where the artist puts their work up in place of an advertisement or alongside an advertisement, or they modify an existing advertisement to change the message. Such takeovers have been going on at least since the mid-1970’s, when the San Francisco Suicide Club modified two billboards and inspired the formation of the Billboard Liberation Front, and the concept has its roots in the Letterist International and Situationist International idea of a détournement. Shorter after the BLF began their work, English also began modifying billboards or replacing them with entirely new messages and artwork (English had been doing street art for a number of years already and was at the time unaware of the BLF, but they would eventually discover each other’s work and become friends and collaborators). One of Fairey’s early projects with the Andre the Giant image was to wheatpaste Andre’s face over a billboard advertising a felonious politician running for mayor of Providence, Rhode Island. In the 1990’s, graffiti writers such as Donnelly and McGee took up the idea of installing art in bus shelter advertising booths. Donnelly in particular change things around a bit when he began inserting his name and iconography into existing advertisements and reinstalling them as though the modifications were legitimately placed there by the companies designing the ads. But the takeovers that I’m thinking about are along the lines of work by the BLF, English, or Fairey: Artworks that are installed to critique or question advertising in some way. The problem with most ad takeovers is that they generally do not last very long. The company that owns the ad location and the companies buying ads do not usually like ad takeovers, and they try to get them removed and replaced as soon as possible. Of course, the artists doing these takeovers, much like Blu and members of Voina, know that. The BLF and English even liked to leave a bottle of whisky or a six-pack of beer at the top of the billboards as a sort of tip to the unlucky guys who would have to come in on short notice to take down their work. So what good are ad takeovers besides a fun way to irritate billboard companies? A single takeover has little impact on the behemoth that is the advertising industry. To some, ad takeovers must seem like pointless and futile efforts to change the status quo that really do little more than force working class men and women to come into work on a Sunday morning to change out an ad. Before the internet came along, the worst case scenario for an artist reclaiming an ad space was that they were caught and arrested, and the best case scenario was that the newspapers got a photo of their work before it was taken down. While I do not want to diminish the work of those early billboard reclaimers, I must admit that I find that a quite limited impact compared to today when doing billboard takeovers can bring down entire companies and inspire actions globally. To some, taking over a billboard probably sounds quite difficult intimidating first hear the concept. The internet begun to change that, particularly sites like the PublicAdCampaign blog that specialize in sharing news about ad takeovers, and now artists all over are being inspired to eliminate public advertising one takeover at a time, posting their results of their work online for all to see. Those actions then inspire even more people by showing them how easy, fun and important it is to reclaim public advertising spaces.